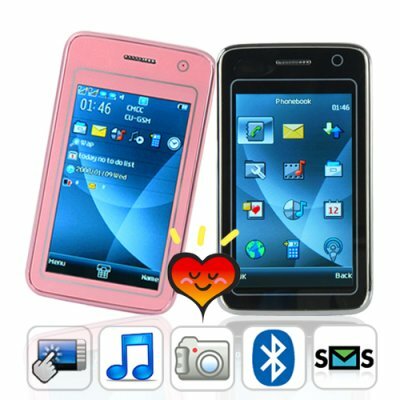 Successfully Added Elegance Cellphone Twin Pack (Black and Pink Phone 2-Pack) to your Shopping Cart. What could be better than buying one M31 Elegance Dual SIM Quadband Cellphone with 3 Inch Touchscreen? Buying two of them! One for you and one for your girlfriend/boyfriend. Whether you buy this as a gift for a birthday or anniversary, now you have a great way to show how much you truly care. Two truly exceptional quadband GSM phones with flawless styling and superb functionality, these highly desirable mobile phones come in a special twin pack containing one glossy pink for her and one glossy black for him. A perfect combination and great way to start 2010 together. A good cell phone is must-have accessory like a favorite pair of shoes or a fine dress watch. Blending daring design and great functionality for the style-conscious, this is the mobile companion to be seen with from the office to the gym and on to the evening party. In a world of mobility, turn heads with pure elegance - the M31 Elegance Cellphone. Coming in a stunning and compact form factor, this is an uncompromising modern phone designed for mobile young professionals. Fully unlocked to work on GSM networks anywhere in the world, these stylish dual SIM Quad Band mobilephones will keep you connected everywhere on the globe. The two SIM card slots mean that important business or personal calls will never be missed whether driving around town or traveling across the world. With the M31 Elegance, a world of digital entertainment awaits. With a spacious 3.0 inch color touchscreen, this stylish cellphone provides an unforgettable experience for the senses. Enjoy the full range of a rich digital multimedia provided: capture life through a lens with the digital camera, enjoy the the onboard video and audio (MP3 and MP4) media players for all your entertainment needs, and take advantage of a whole host of other digital media features while on the move. A sleek and intuitive touchscreen interface and accelerometer feature place you in total control of this mobile phone. Designed for the modern mobile city dweller who works hard and plays hard, this phone also comes with powerful productivity tools to organize your work, maximize your productivity and keep on top of your active lifestyle. With a modern phonebook and contact manager, stay on top of your social and work life in today's busy world. These fashionable and attractive cellphones can only be purchased in these special twin pack from us. Whether you want to give them as a present for a special occasion or just a thoughtful Valentine's gift, these mobile phone will be appreciated by anyone who loves great design. Order yours today and we will express ship them out tomorrow - guaranteed! NOTE: This GSM product is compatible with the four frequencies of 850MHz, 900MHz, 1800MHz, 1900MHz. It can be used throughout the world. Please check that the local cell network matches the phone's GSM standard. Click here to view your regions cell phone network. The second SIM card slot may not register properly with your carrier if you live in Ireland, Sweden or the Netherlands. Both SIM card slots will work fine in all other countries in the world. But if you live in these two particular regions we suggest you choose another mobile phone model with dual SIM card slots. Do these new Elegance cell phones have different features from the original, best-selling Elegance? This is a special promotional 2-pack at a great price. The phones are the same as the individual units, but these come with a limited time promo price. I am a reseller and I want to know how long will this promotion be in effect? This special promotional 2-pack will be available until World Love Day (May 1st). This promo pack will go offline on May 2nd (or possibly earlier if our warehouse stock runs out sooner than that).